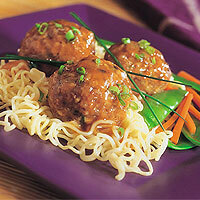 These succulent meatballs are rich in the flavors of ginger and sesame. Heat oven to 350°F. Combine ground veal, bread crumbs, mushrooms, egg, chopped green onion, soy sauce, ginger and 1-1/2 teaspoons sesame oil in large bowl, mixing lightly but thoroughly. Shape into 12 meatballs. Place in greased 15 x 10-inch baking pan. Bake in 350°F oven 15 to 20 minutes or until lightly browned and not pink in center. Combine cornstarch mixture and bouillon granules in medium skillet. Cook and stir until thickened and bubbly. Stir in 1/2 teaspoon sesame oil. Add meatballs; stir gently to coat. Serve over noodles. Sprinkle with sliced green onion.